“At 2 o’clock in the morning, the auroras were so bright I could see them through the glare of the full Moon,” he says. At the peak of the storm, Northern Lights spilled across the Canadian border into US states such as Michigan, New York, Montana, Wisconsin, and Indiana. People in Alaska witnessed a fine display as well. At the same time, Southern Lights were photographed from several locations in New Zealand. Forecasters did not see this coming. The stage was set for the storm when a minor CME arrived with little fanfare about 24 hours ago. First contact with the CME barely registered in solar wind data, and Earth’s magnetic field was unperturbed. The action began only after Earth entered the CME’s wake, where strong south-pointing magnetic fields opened a crack in our planet’s magnetosphere. A surprise geomagnetic storm ensued. 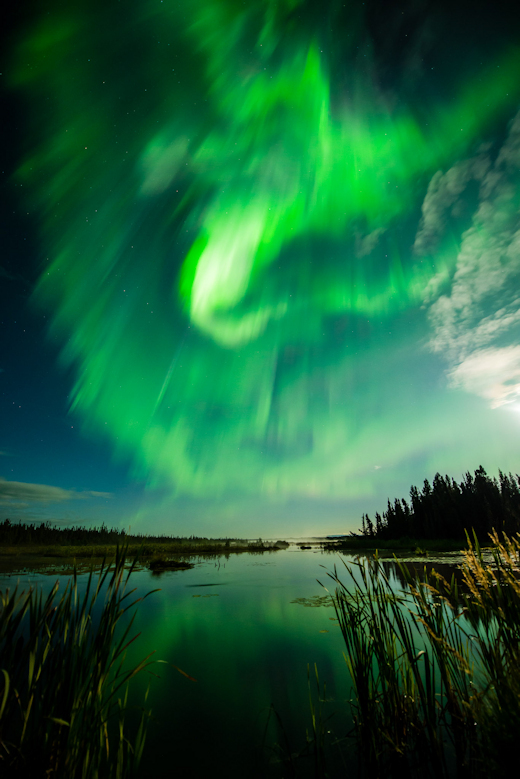 Aug. 20, 2018: A new type of aurora nicknamed “STEVE” may not be an aurora at all, according to a new paper published August 20th in the Geophysical Research Letters. A group of researchers combined satellite data with ground-based imagery of STEVE during a geomagnetic storm to investigate how STEVE is formed. “Our main conclusion is that STEVE is not an aurora,” said Bea Gallardo-Lacourt, a space physicist at the University of Calgary in Canada and lead author of the new study. STEVE is a purple ribbon of light that amateur astronomers in Canada have been photographing for decades, belatedly catching the attention of the scientific community in 2016. It doesn’t look exactly like an aurora, but it often appears alongside auroras during geomagnetic storms. Is it an aurora — or not? That’s what Gallardo-Lacourt’s team wanted to find out. Auroras appear when energetic particles from space rain down on Earth’s atmosphere during geomagnetic storms. If STEVE is an aurora, they reasoned, it should form in much the same way. On March 28, 2008, STEVE appeared over eastern Canada just as NOAA’s Polar Orbiting Environmental Satellite 17 (POES-17) passed overhead. The satellite, which can measure the rain of charged particles that causes auroras, went directly above the purple ribbon. Gallardo-Lacourt’s team looked carefully at the old data and found … no rain at all. Another study has shown that STEVE appears most often in spring and fall. With the next equinox only a month away, new opportunities to study STEVE are just around the corner. Stay tuned and, meanwhile, read the original research here. August 15, 2018: This summer, something strange has been happening in the mesosphere. The mesosphere is a layer of Earth’s atmosphere so high that it almost touches space. In the rarefied air 83 km above Earth’s surface, summertime wisps of water vapor wrap themselves around speck of meteor smoke. The resulting swarms of ice crystals form noctilucent clouds (NLCs), which can be seen glowing in the night sky at high latitudes. And, no, that’s not the strange thing. Other observers saw similar displays in July and then, in August, the clouds persisted. During the first half of August 2018, reports of NLCs to Spaceweather.com have tripled compared to the same period in 2017. The clouds refuse to go away. The red curve traces water vapor levels in the mesosphere for 2018. “July went out like a lion!” says Harvey. In addition to being extra wet, the mesosphere has also been a bit colder than usual, according to MLS data. The combination of wet and cold has created favorable conditions for icy noctilucent clouds. Harvey and her colleagues are still working to understand how the extra water got up there. One possibility involves planetary wave activity in the southern hemisphere which can, ironically, boost the upwelling of water vapor tens of thousands of miles away in the north. The phenomenon could also be linked to solar minimum, now underway. It is notable that the coldest and wettest years in the mesosphere prior to 2018 were 2008-2009–the previous minimum of the 11-year solar cycle. Stay tuned for updates and, meanwhile, be alert for NLCs. Dennis Put photographed this partial solar eclipse over Maasvlakte, The Netherlands, on Jan. 4, 2011. The first thing to remember about a partial eclipse is don’t stare at it. Even the tiniest sliver of sun left uncovered by the Moon can hurt your eyes. Instead, look at the ground. Beneath a leafy tree, you might be surprised to find hundreds of crescent-shaped sunbeams dappling the grass. Overlapping leaves create a natural array of pinhole cameras, each one casting an image of the crescent-sun onto the ground beneath the canopy. No trees? Try this trick: Criss-cross your fingers waffle-style and let the sun shine through the matrix of holes. You can cast crescent suns on sidewalks, driveways, friends, cats and dogs—you name it. Hand shadows are fun, too, like the crescent-eyed turkey shown above. Because partial eclipses typically last for more than an hour, there is plenty of time for shadow play and photography using safely-filtered telescopes and cameras.